Rio de Janeiro : Rocco, 1990. This is the first Brazilian paperback edition of A Thief of Time. This edition was published in 1990 by Rocco in Rio de Janeiro, Brazil. 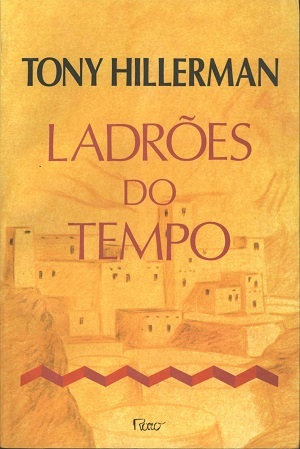 The text was translated from Tony Hillerman's original English into Portuguese by Paulo Azevedo. The cover was designed by Ana Maria Duarte and features a sketch of Cliff Palace, which is a cliff dwelling located in Mesa Verde. This is interesting because a majority of the book is set in Chaco Culture National Historical Park and not Mesa Verde National Park. Format: Paperback, 2.8 x 14 cm. Binding: Full-color paper covers with the publisher, title, and author printed vertically in black and red on the spine.